Phone in the pad? Yes! Infinitely! 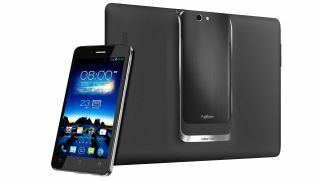 Asus has only gone and made the Padfone Infinity official over at MWC 2013. Rocking Retina display-beating 441ppi display tech and a 1.7GHz quad-core Snapdragon processor, it's going to be one of the handsets to beat this show. It's running Android 4.2 and has the familiar aluminium unibody design housing its Super IPS 5-inch screen. There is 2GB of RAM keeping things running smoothly, NFC and 64GB of memory. The camera is a 13MP affair, with Asus touting its lagless shutter speed and a dedicated low-light image sensor. On to the Pad, and the docking station converts the phone into a 10.1-inch tablet with 1920x1200 resolution, as well as adding a 1MP front-mounted camera and a micro USB port. It sounds as though Asus is looking to ship the latest PadFone for around £875 (around $1325 or AU$1287) so if you like the sound of it, you'd better get saving. The PadFone Infinity release date has been set for April. Amidst the craziness, we're waiting on more details and pictures of the handset from Asus - stay tuned for those and our hands on Asus Padfone Infinity review.